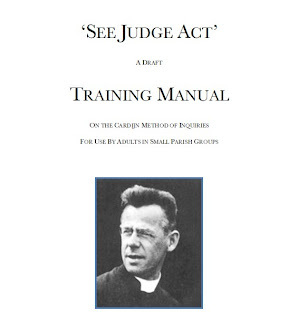 We are pleased to announce that the CCA “See, Judge, Act Draft Training Manual” for use in parish groups is now available for download. Click on the link below. Our ‘Gospel Action’ Group is going through the ‘draft’ manual. So far we have found that the Social Enquiry coupled with the Gospel Enquiry and the Facts of Life, when we do the See, Judge, Act on each, make a very lenghty meeting. Perhaps a GUIDE on how to make use of the ACTS coming out of the Gospel & Facts of Life could be incorporated into each ‘Gospel & Social Enquiry’ with instructions for the ‘secretary’ on how to proceed at a later meeting.